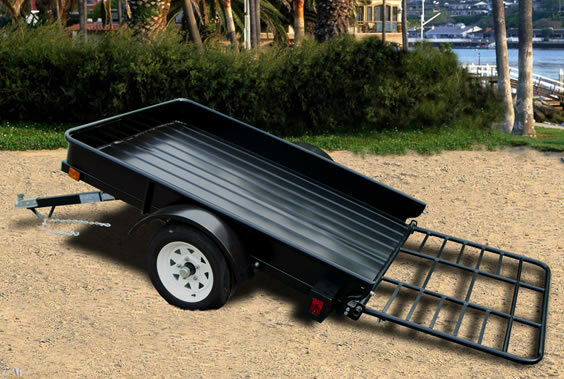 This 4’x6’ EZ Dump™ is a all purpose low profile solid corrugated steel dump trailer kit designed specifically for handling a variety of hauling tasks. Ideal for pulling behind any vehicle out on the open road, this trailer is great for hauling solids such as dirt, clippings, gravel, small landscape equipment, or just hauling your ATV or bikes into the back woods, this trailer is engineered to provide exceptional balance and ease of mobility without giving up one ounce of payload capacity regardless of the job. The front rail makes an excellent chock when tying down your four wheel friends! Plus the trailer incorporates our exclusive floating ramp gate which will lay flush on the deck to accommodate longer pay loads as well as lay flush with the deck at any angle to accommodate smooth loading. With the tongue weight being less than 30 pounds, virtually anyone can easily move, push, pull, hook up, or tow this trailer.